OSAKA - After a number of natural disasters hit the area last summer, a government bureau in western Japan began trials Monday for a multilingual smartphone-based service to provide overseas tourists with disaster information. The service, operated by the Kinki Bureau of Telecommunications in Osaka, will ultimately provide weather news and evacuation orders in several languages, and will allow foreign embassies to issue messages to their nationals in emergency situations. Sightseeing information will be offered through the service when there is no disaster. Osaka is aiming to launch the service by June, when the city will host the Group of 20 summit. With the upcoming Osaka 2025 World Expo and the increasing number of foreign workers in the country, the government hopes to be better prepared in order to avoid situations such as those seen last year where foreign visitors in disaster-affected areas struggled to gain access to information about transport disruptions. 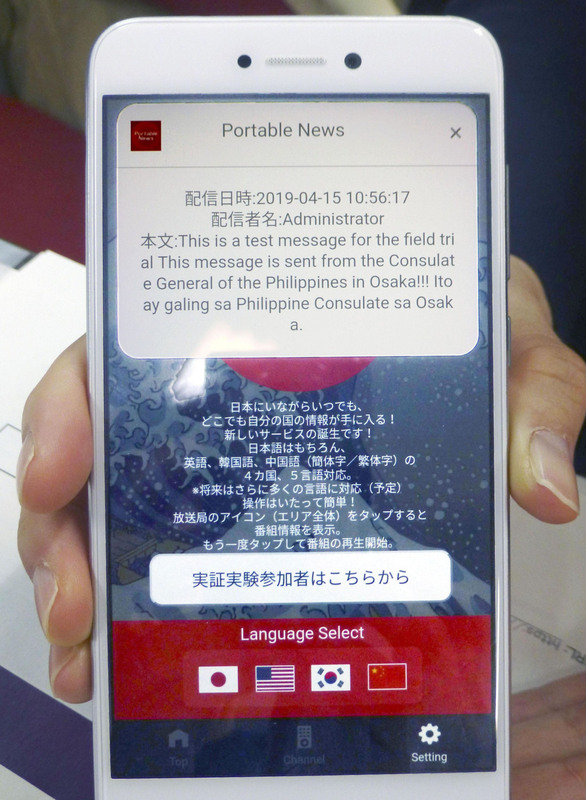 On Monday personnel from the Vietnamese, Peruvian and Filipino consulates gathered at the bureau in central Osaka to confirm trial messages sent to smartphones using the existing news app for tourists, Portable News. Consul General of the Filipino Consulate Patrick Hilado said the system was easy to use, praising the capability it offers to narrow down an intended audience. 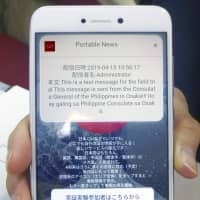 As fake posts and rumors can spread through social networks during disasters, the bureau plans to limit the sources of information to public institutions and disaster-relief organizations. Osaka and other parts of western Japan were hit by earthquakes, torrential rain and typhoons last year. The city is also a major gateway to key tourist sites such as Kyoto and Nara.